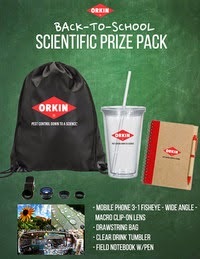 Who's ready for a fantastic prize pack-- perfect for Fall! By sharing this giveaway, I even get a prize pack of my own! So excited for that camera lens! Just take the fact or fiction quiz below and then enter via the rafflecopter! MamaBreak received a prize pack in exchange for posting and sharing this giveaway. The sponsor is responsible for the shipment of the prize. I took the quiz and got 5 out of 5 questions right. You got 1 out of 5 correct. I got 4 out of 5 questions correct. I got 4 out of 5 right. I got 5 out of 5 correct! I got 4 out of 5 answers correct. I am not a fan of spiders. I scored 5 out of 5 correct on their informative quiz. Thanks for the giveaway…scored 4 out of 5.